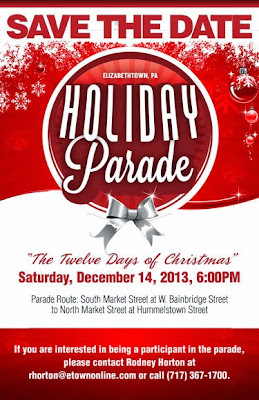 Elizabethtown is getting ready for holiday festivities, including the holiday parade at 6 p.m. on Saturday, Dec. 14. This year's theme is "The Twelve Days of Christmas." And if you've been around E-town for the parade, you know it's one of the largest community events. Every year, thousands of people jam the downtown to see Santa Claus, floats, bands, fire trucks and an array of organizations. Last year, the borough changed the parade to a Saturday evening instead of a Friday, and by all accounts (at least from what my colleagues on Borough Council and the staff at the borough have said), it was a great success. This year, the downtown organization Market Street Improving Business is shadowing the borough staff since MSIB will take over organizing and running the parade in the future. In fact, MSIB has taken over the upcoming New Year's Eve celebration "Let E-town Ring." According to discussions at Borough Council earlier this year, MSIB President Andrew Schoenberger said the event would be expanded to include the Dove Promise Drop at midnight EST rather than at 7 p.m. to match the time of Elizabethtown's sister city Letterkenny in Ireland (as has been the tradition for the event). This year will also include fireworks, which were featured for the first time at last year's event. It is great that a community organization like MSIB is taking on these events. When the Elizabethtown Chamber of Commerce decided to hand over the events to the borough to run last year, we were looking for community groups that would be interested in taking them over. I am pleased that MSIB has stepped up because it means they are taking ownership of them, which I hope will ensure they will be successful well into the future. The parade and "Let E-town Ring" are established events, and I think new people with new ideas can make them even better. So if you're around for the holidays, I encourage you to support the community -- and downtown Elizabethtown -- and come out for these great events.